Comet was released by Williams in June of 1985. It was designed by Barry Oursler with art work by Python Anghelo. 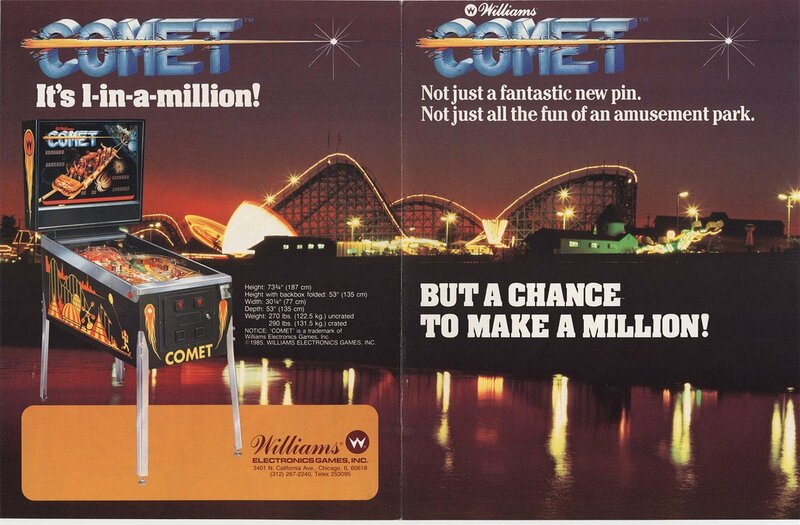 Comet was one of the three System 9 games released by Williams (Space Shuttle and Sorcerer being the other two). 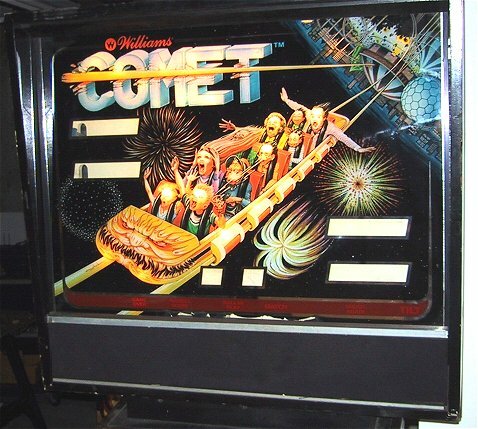 Comet was also the first of the "trio" of amusement park roller coaster games to be released by Williams. Cyclone (1988) and Hurricane (1991) complete the trio. Comet had been on my "wish" list for over a year. It wasn't a game that I was going to actively try to find, but if one found me I would consider buying it. In December of 2001 I attended the Pennsauken, NJ auction on the lookout for a good deal. I had my eye on a pair of Pinbots (Williams, 1986), a Black Knight 2000 (Williams, 1989) and a Laser Cue (Williams, 1984). All four games played well, with one of the Pinbots having the numeric displays out and the Laser Cue had some funky bell ringing going on. The auction was interesting, the crowd was mostly "Christmas" buyers, and the prices all ranged from $500 to $1,500. There were some great deals (CV for $1,800) and some screwy ones. Mainly the games I was interested in! The Laser Cue went for $480! (I bid up to $350). Then both of the Pinbots went for around $800... I heard through the auction grapevine that the BK2K would be a buyback up to $900, and sure enough, I watched the owner bid it up to $900. Then they came to this Comet. 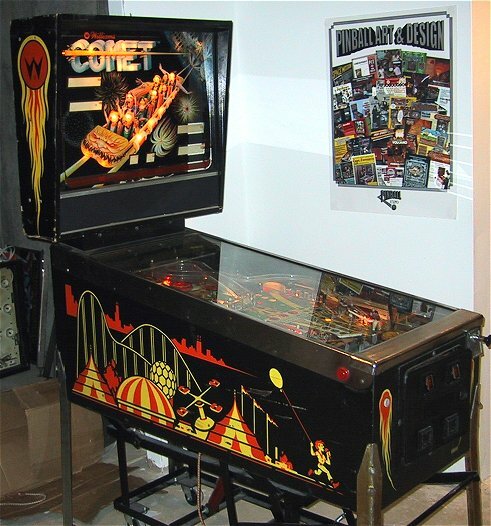 I had seen it earlier, but it had no displays and no playfield glass or lockdown bar. Nobody even bothered turning it on. Well, they powered the thing up for the auction and it actually booted and played a game. It started at $50, and I put a bid in during the initial frenzy, and before I knew it the auction was over and I had bought a Comet for $85! If there is truly a "deal of the day", then this was it. It was just about the last pin, so I guess the guys who were buying were done. In parts alone, its worth a couple of hundred with a working System 9 board, power supply and sound board. I have bought more than my share of "duds" (my first Firepower II comes to mind, 8 hour drive for a piece of crap...), so the pinball gods owed me this one... The game sat in my garage from December 1st of 2001 until late February 2002 (only 3 months, not bad..) I had a friend over and convinced him to help me lug it downstairs in one piece. I normally disassemble the games to take them down myself, but having the manpower to not take it apart saved me a couple of hours of work. Even though they powered the game up at the auction and had a ball in play, I went over the game with a fine tooth comb and powered it up the first time with the solenoid and lamp fuses removed. I added a few credits and the game started. After checking the wiring I first put the lamp fuse back in and got the CPU lights going, then put the solenoid fuse back in. No smoke, no smell and no locked on solenoids so I actually played a game. - No displays, but it has the display driver board. Plugged in some displays and they almost worked. I'll need to locate a new driver. - The right slingshot kicker doesn't work, nor do two of the pop-bumpers. - The backglass is flaking at the bottom. I plan to triple-thick the glass, then repaint the black. If you had to have a glass flaking, you couldn't ask for a better part to be bad. 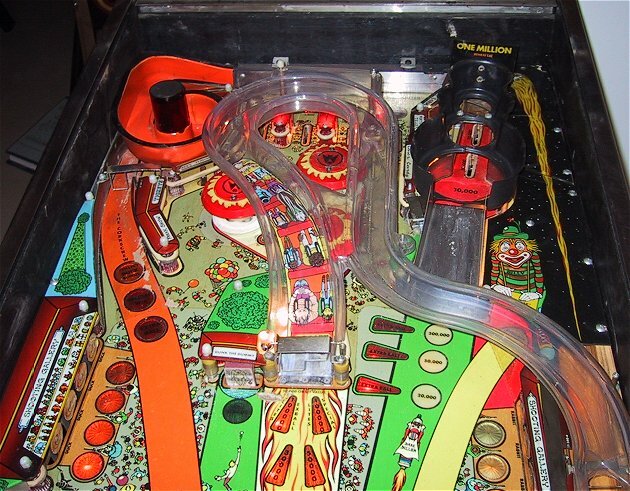 - The bottom of the playfield was Mylared and is in great shape. There is some bubbling around the inserts and I'm on a fence about removing it. I may try to fix the bubbling and clean the Mylar up first to see how it turns out. - The top of the playfield is worn in a few spots. It should touch up nicely. - All of the plastics are present and in good shape. - The two ramps have cracks in them, but you have to have a good eye to find them. They'll do just fine until I find new ones. 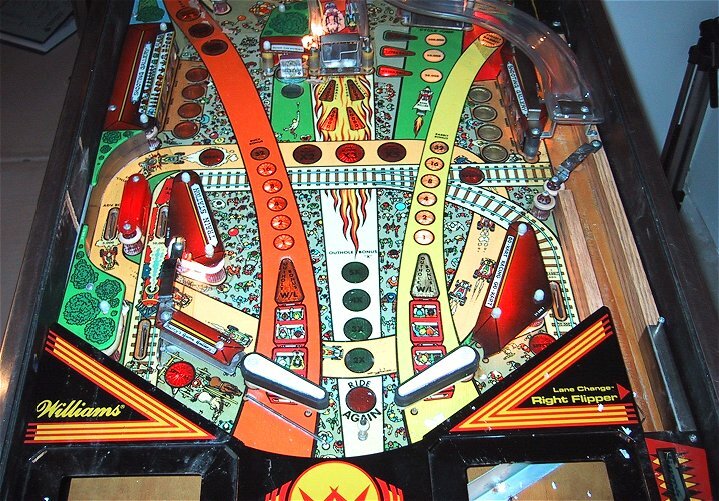 - All of the playfield posts have more wax in them then I've every seen before and will probably need to be replaced. 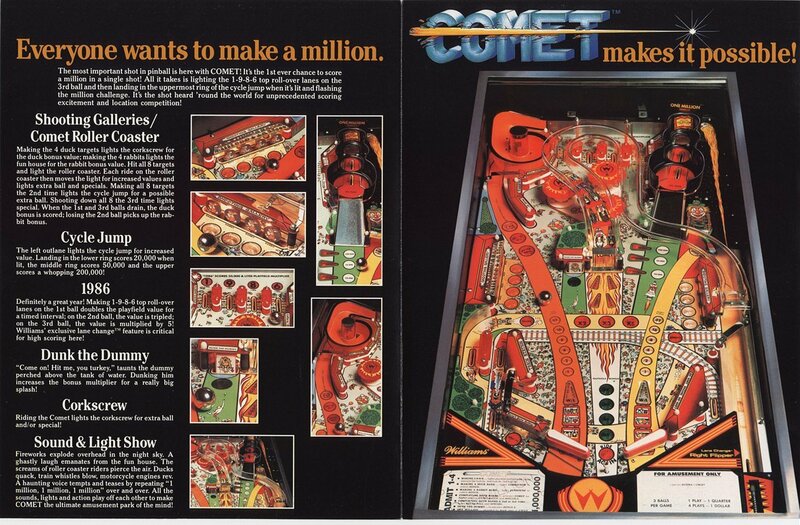 At least they waxed the playfield! - The cabinet is in good shape, a few nicks and gouges, but nothing that can't be touched up. - The coin door is a mess and will need some major work.